The same view as the above photo of the Grand Trunk Trail as it is seen today. Thanks to Tom Chamberland for submitting the photo below. He is one man that truly knows the past, present, and future of our trails in town. Tom is a ranger with the US Army Corp of Engineers, and our local Tree Warden, and has been involved with all aspects of trail design, and building here in town. So much work has been done along the Grand Trunk Trail over the past decade, or so. From an abandoned railroad right-of-way to a recreational venue used by so many. 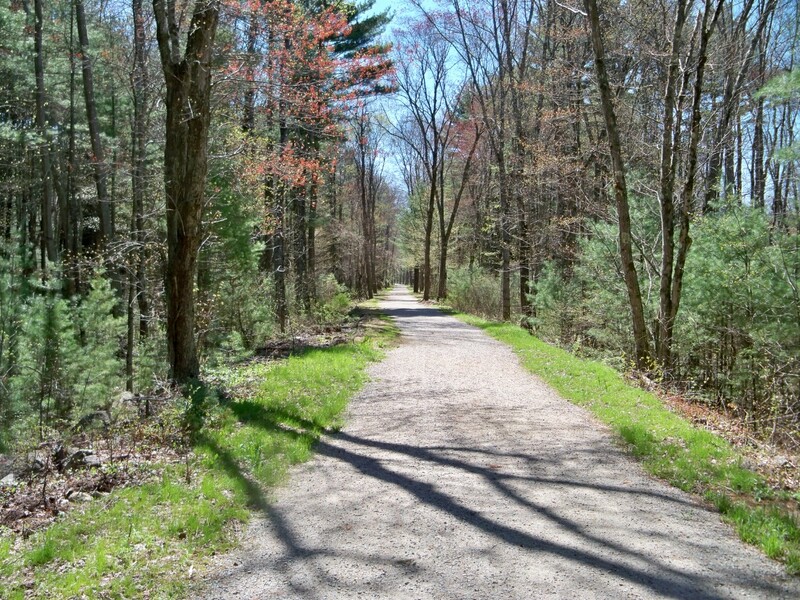 Mary and I have walked, and biked, this trail, and other trails in town, many times. The enjoyment is free, natural, and comes with a smile back guaranty. OK, the last part is just me being me, but if you walk the length of the trail, and don't smile at least once, then I owe you one. Thanks Wally, over 90% of all trail work in town is done by volunteers and donations. This Saturday (April 19th) is the first "third Saturday of the month" trail work day. We will be meeting at the Riverlands at 0900 - noon, with a focus on building a shed roof to store supplies and conducting a general cleanup of the riverlands ( Earth Day is April 22!) from past operations on this property. Bring Gloves and a water bottle...... Trail Committee will be holding volunteer work days every third Saturday of the month from now thru November. See you on the trail!